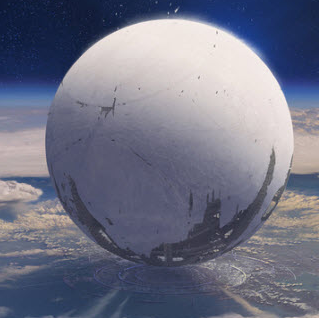 If you're even remotely interested in high-end gaming, you've probably heard of Destiny, also known as "that shooting MMO game that's kinda like Halo from the people who made Halo." The marketing team for Destiny has decided to team up with Google to create an interesting way for excited players (or prospective players) to check out the environments of the game. It's called Destiny Planet View, and it blasts the Google Street View interface into the solar system for a look at some fictional alien worlds. The moon, Mars, and Venus are all populated with pre-rendered environments from Destiny laid out in Street View's signature style. You can "walk" along the designated paths to explore a small town's worth of real estate on each heavenly body. While this is billed as a virtual tour of each satellite, it's really a fancy way of exploring some of the backstory of the game, with all the flavor text narrated in a sarcastic and gravely voice. The short version: humanity got blasted away a long time ago, and now that we're back on our feet, various space baddies would like to chop them off. Various points of exploration include even more backstory, or a quick trailer showing off the gameplay in the upcoming title. You can check it out in your browser on the desktop, ChromeOS, and mobile at destinyplanetview.com. Destiny will be released on September 9th for the Xbox 360, Xbox One, PS3, and PS4.